You’ll find these options on the Flash run configuration dialog via Run | Edit Configurations. This feature requires AIR SDK 3.4 or higher. Since AIR SDK 3.4 isn’t bundled with the latest Adobe Flex SDK 4.6 or Apache Flex SDK 4.8, you need to download it manually and copy it over your Flex SDK. Make sure you have installed iTunes 10.5.0 or higher on your computer, for direct deployment to an iOS device. You can try this feature in the latest IntelliJ IDEA 12 EAP. As always, feedback is very much welcome on our forum and in our issue tracker. This entry was posted in New Features and tagged ActionScript, AIR, Flex, iOS, Leda, Mobile. Bookmark the permalink. Nice! And what about Flexunit support for mobile projects? Any update? Trying to add the Adobe Gaming SDK but Intellij 12 Ultimate doesn’t recognize it’s home directory as valid. Am I missing something? Feature saves a good amount of time. Ran into a few issues deploying it to iOS simulator but other than that works great. I do not see the “iOS Device” or “iOS Simulator” in the new configuration dropdown. 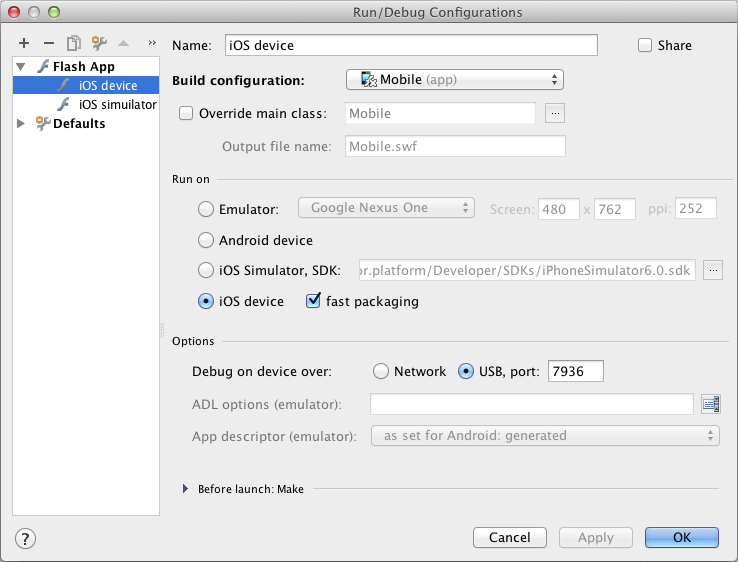 I have an air app which builds and deploys under gradle just fine — how can I enable device debug in IntelliJ? @Craig: Make sure that you have Flash module with properly configured Flash build configuration. Project Structure | Modules | [your module] | [build configuration subnode] | General tab: target platform must be Mobile. Check other tabs as well. GradleFx is not supported by IntelliJ IDEA yet, so you need to configure the project manually. Is it possible to profile my app running on an iOS device? Debug works great but I was wondering if I can get into the guts of the app running quasi-natively. No, unfortunately ActionScript Profiler plugin doesn’t support profiling on real devices. It does not find the devices I’m using AIR 19 + IntelliJ IDEA 14 Ultimate. Most likely the bug is fixed in AIR SDK 20, please try to upgrade.